Plastic bumpers and trim can suffer the ravages of time and harsh driving conditions just as much as your paintwork. 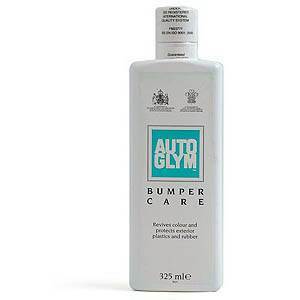 Autoglym Bumper Care cleans and revives colour, restoring ageing trim to its original finish. For general application apply with a piece of dry automotive car sponge. Ideal for removing dried on polish stains from bumpers and trim. Use a piece of sponge or an old toothbrush to agitate surface. Particularly effective on vinyl roof hoods. Use to rejuvenate the vinyl and help to proof against water.